The Gujjar community agitation demanding five per cent quota in jobs and education turned violent Sunday with shots being fired and police vehicles torched in Dholpur district and protesters blocking road and rail traffic in many areas in Rajasthan. As a precautionary measure, authorities have imposed prohibitory orders under CrPc section 144 in Dholpur and neighbouring Karauli districts, police said. At least 20 trains were cancelled and seven diverted during the day as the protesters, led by the Gujjar Arakshan Sangharsh Samiti chief Kirori Singh Bainsla, continued their sit-in on railway tracks in Sawai Madhopur district for the third day on Sunday, officials said. The sit-in began on Friday evening and has affected the movement of over 250 trains through the region since. The agitators also blocked highways connecting major cities on Sunday. According to police officials, three cases have been registered in connection with the blocking of traffic. Violence broke out in Dholpur district as unidentified miscreants fired 8-10 rounds in the air while a blockade on the Agra-Morena Highway was in place, Superintendent of Police (SP) Ajay Singh told PTI. The protesters set afire three police vehicles -- two jeeps and a bus, he added. The SP said the protesters also pelted stones, injuring four personnel, adding that police had to lob tear gas shells to disperse the crowd. 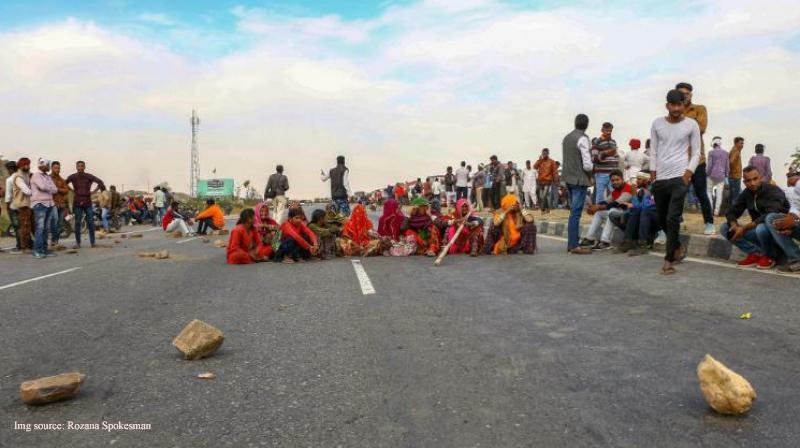 The Hindoli-Uniyara state highway was blocked in Bundi district, where hundreds of people demonstrated throughout the day. As traffic movement came to a halt, vehicles were diverted to other routes. The demonstrators, however, allowed the passage of ambulances and vehicles with patients or pregnant woman. Chief Minister Ashok Gehlot called the stone pelting and the torching of vehicles unjustified. "Holding protest is justified but sitting on railway tracks is not. Protesters should come forward for talks. The government is open for dialogue and has constituted a committee," he said. Referring to the violence in Dholpur, Gehlot said, "Anti-social elements have joined the protest. Administration and police will investigate the reasons of the incident. Gujjar leader Kirori Singh Bainsla has appealed to maintain peace so people should listen to him." According to the Northern Railways, trains like 12953 Mumbai Central-Hazrat Nizamuddin August Kranti Rajdhani Express, 19022 Lucknow Jn.-Bandra Terminus Express, 12059/12060 Kota-Hazrat Nizamuddin-Kota Jan Shatabdi Express and 12909 Bandra Terminus-Hazrat Nizamuddin Garib Rath Express were among those which were cancelled. At least 13 trains were running late in the zone. The 22405 Bhagalpur-Anand Vihar Garib Rath Express, Mumbai-New Delhi Rajdhani Express, Howrah-New Delhi Poorva Express were delayed by around three hours while the Raxaul-Anandvihar Sadbhavna Express was running late by seven hours, it said. The Northern Railways said 19024 Firozepur-Mumbai Central Janata Express, Shri Mata Vaishno Devi Katra, 12472 Shri Mata Vaishno Devi Katra-Bandra Terminus Swaraj Express, 12450 Chandigarh-Madgaon Goa Sampark Kranti Express and 12904 Amritsar-Mumbai Central Golden Temple Mail had been diverted. On Saturday, a state government delegation, including Tourism Minister Vishvendra Singh and senior IAS officer Neeraj K Pawan, had met Bainsla and his supporters to hold talks, but no agreement could be reached. Bainsla has said that the community will continue their protest demanding five per cent reservation to the Gujjars, Raika-Rebari, Gadia Luhar, Banjara and the Gadaria communities in government jobs and educational institutions as promised. "We will remain on dharna. We do not want to talk with the government. We are waiting for the government to give the order for five per cent reservation," Vijay Bainsla, son of Kirori Singh Bainsla, said. He said an appeal had been made for maintaining peace but it was the angst of the people which have come out during the protests.